Last week, the giant rift in Fortnite’s sky started spewing lightning until it finally dropped a glowing alien cube on the map. The cube has started moving and changing the landscape, encouraging players to sleuth out where it’s ultimately headed and what will happen when it gets there. The saga technically started back in May when a giant comet fell on Dusty Depot. This set off a chain of events leading to a rocket launch that cracked open the sky and scattered strange, time bending anomalies around the map. The crack began shooting lightning last week, destroying a circle of cacti southwest of Paradise Palms before dropping a massive cube. The cube was initially dormant, although players standing near it would slowly receive shields. But then the cube started to move. Starting last Saturday, the cube’s been moving about once every 51 minutes. Initial attempts to track the cube’s course led one intrepid player to calculate the centre of the cube multiple times. This led them to believe that the cube would travel in a straight line towards the centre of the map. The truth is more complicated; the cube’s path is less direct, but calculations seem to place it on a similar trajectory. It will soon rest south of Loot Lake. During this travel process, the cube left a glyph on the ground south of Salty Springs. 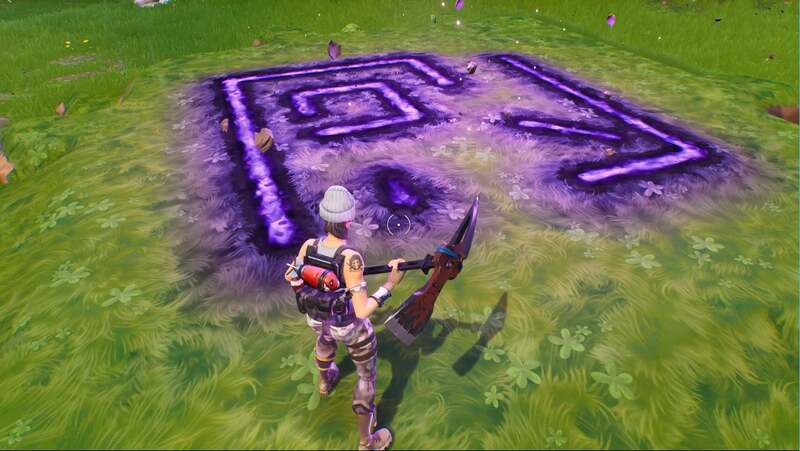 The area around the glyph has a slow gravity effect similar to those granted by the hop rocks that littered Dusty Divot. Players in a massive tracking thread on the game’s Reddit claim to have datamined seven other event flags for placing down runes. This would suggest that there are at least six more glyphs on the horizon. This information supposedly includes a “MoveToLake” and “Lake” flag, leading players to wonder if the cube will end up in Loot Lake or somehow create a lake of its own. Fornite’s current battle pass season ends on 25th September, which suggests there’s still a fair amount of time before the cube completes its journey, if it’s going to follow the trend of Season Three’s comet or Season Four’s rocket. In the meantime, here’s a map plotting out the cube’s route and projected movement times just in case you want to play amateur scientist and observe the cube in its full glory.